Habitat : Found in kashmir and the temperate western himalayas. 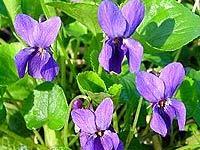 Uses : The flowers and leaves of viola are made into a syrup used for respiratory ailments associated with congestion, coughing and sore throat. Flowers are also edible and used as food additives for instance in salad, made into jelly and candied for decoration. A decoction made from the root (dry herb) is used as a laxative. Tea made from the entire plant is used to treat digestive disorders. It acts as a medicinal remedy for headache, body pains and as a sedative. It is used externally, the fresh crushed leaves reduce swelling and soothe irritations. As a bath additive the fresh crushed flowers are soothing to the skin and the aroma is very relaxing. It is effective in the treatment of headaches, migraine and insomnia. The whole plant is anti inflammatory, diaphoretic, diuretic, emollient, expectorant, and laxative. It is taken internally in the treatment of bronchitis, respiratory catarrh, coughs, asthma, and cancer of the breast, lungs or digestive tract. Externally, it is used to treat mouth and throat infections. An essential oil from the flowers is used in aromatherapy in the treatment of bronchial complaints, exhaustion and skin complaints, used in perfumery and to flavour breath fresheners. The petals are made into a syrup and used in the treatment of infantile disorders. The herb shows antibacterial activity and is effective in treatment of eczema.